Vern Burkhardt (VB): In The Business Model Innovation Factory when discussing how an organization captures value you say, "Leading with price is a sure sign of an undifferentiated product or service." Is this always the case? Saul Kaplan: I find to topic of pricing fascinating. For sure it's the least well-understood and most poorly practiced element of the marketing mix. Pricing is so important to establish a value to what we're doing, and to communicate with our customers about what that value is. We need to get far better at playing with the price levers. We should be far more experimental around pricing as one of the elements of the business model. It's a lot of what I write and talk about regarding business model experimentation. You see many new models in existence where things are free. They're called 'freemiums'. They scare the you-know-what out of most corporate leaders because they see a lot of what they've been getting paid for – like newspapers or the rest of the media industry – and they can see that people are getting this content for free. Their first effort is to try to protect the content. Their second effort is to try to build new business models around it. It's interesting to look at the 'freemium' business models. I often say, "Free can be the best price; it just can't be the only price." There are a lot of companies stuck in an old business model, and they don't have the ability to experiment with potentially new models. The newspaper industry is a perfect example. They didn't experiment soon enough. Now they're in a world of hurt. They're beginning to experiment, but they need to scale much faster because their core businesses are being devastated. If they had been experimenting sooner the media industry would have been in a much better position to understand which business models are viable, and how to create business models where there might be a free layer but also premium layers that people pay for. Maybe the new business model requires less bricks and mortar and a different set of skills and capabilities. They need to get far more experimental. VB: When you have a positive financial bottom line you can afford some dedicated resources to consider different business models, but the tendency is to wait until the organization is desperate. Saul Kaplan: No question. You can see this all the time. Take a look at Sony and the music business, which is a story I tell in my book. Sony had all the capabilities and parts, and should have owned the music business. They just couldn't play with the parts. All their capabilities were locked into business units and business models that had no flexibility and ability to experiment. They had a music division with many of the top artists around the world under license. They had a technology division that made innovative products – they invented the Walkman for heaven's sake. What they needed was a business model innovation factory so they could recombine the parts and play with different business models. Instead, because they didn't, Steve Jobs came along and completely blew Sony away. Sony still hasn't recovered even today, and Apple has created the world's largest business because they were able to play with the parts, reconfigure them, and deliver value in a different way. Apple completely disrupted the music business because of this. By the way, Apple didn't invent anything either. There were dozens of music players in the marketplace. They created a cool one, no question about it. Apple's real magic was a business model that not only created a product, but it also created a service and access to music in an integrated, seamless way. It was a beautiful thing and Sony could have done it. But they didn't. VB: "Industrial-era organization structures are getting in the way of innovation." What needs to change? Saul Kaplan: We need to get comfortable with the duality of improving our current business model and developing new business models. The job of leaders is to know how to convince people that their organization has to do both things at the same time. Leaders need to be clear about who is working in the core and trying to strengthen it. Who is in charge of this? Leaders also need to identify where in their organizations they are creating the sandboxes where people can play with new business models. Leaders need to make sure that the sandbox has autonomy, access to capabilities, and sufficient resources to be able to do this exploration. It's not easy to do because people working in the core business model often see what's going on in the sandbox as a threat to their core business. One of the techniques for creating new business models is to set up a Business Model Innovation Factory – the sandbox – and then move people back and forth between the core and the sandbox so people get exposed to the need to do both things. People from the core who are moved into the sandbox are tasked to experiment with new business models, and then people who have been working in the sandbox move them back into the core. Through these back and forth movements you start to establish the culture that says, "We're going to be constantly improving our current business model and we're going to be constantly looking for the next one. We're going to be making changes over time and people are going to need to be comfortable with moving back and forth across these business models, and adapting to new business models when they are implemented in the core." This hybrid approach is the way twenty-first century organizations are going to work. It's an execution machine driving today's business model, and a network model that knows how to play with the parts and the capabilities to be able to experiment with entirely new business models. VB: "R&D for new business models is the new strategic imperative." Why is it imperative to create a business model innovation factory? Saul Kaplan: It's imperative because the shelf life of a business model is decreasing. If you don't create a business model innovation factory you're going to be disrupted, it is going to be painful, and you may or may not survive. It's not merely a scary idea applicable to a few companies. A question every executive suite needs to think about is how vulnerable are we? Unless you're at Harvard, Yale, or Dartmouth if you're the president of a college and you don't see the potential disruption of online learning and other programs that can completely disrupt what you do you're not aware of the likely future. Especially mid-tier colleges are incredibly vulnerable to being completely disrupted by someone coming into the market with completely different price points to deliver higher quality educational content. Are you as a college president experimenting with this question? How are you preparing yourself to implement new or different business models? The threat of being disrupted even to the point of being put out of business or no longer being financially viable is true for every leader today. If you're not considering these issues and designing new business models, then you're at great risk of being disrupted or losing competitive position. VB: "The first step in creating a business model innovation factory is an explicit leadership decision to explore and test new business models." Is this also the hardest step? Saul Kaplan: It's not hard to do. It's a matter about being explicit about it. If you're leading an organization and firmly believe that your current business model is sustainable and all you need to do is continue to strengthen and protect it, then you should say this clearly to your organization and organize around this view. Indeed, this is what most leaders do even if they haven't considered the viability of their current business model! But if you're vulnerable to being disrupted, or you want to be the 'market maker' – the creator of entirely new business models – then you had better explicitly set a clear strategy to experiment and develop new business models. If you're not being explicit and not organizing differently around this objective, you're not going to get new business models being identified and explored. Let's imagine you create an innovation department and tell them, "I want you to do both things. I want you to come up with new ideas for the core business and I want you to be bold. I want you to think out of the box. I want you to create disruptive business models." If the line business leaders are overseeing those initiatives and deciding which projects to do or not to do there will be no big surprise. Guess which projects they will do? They will do the projects that help them improve the performance of the current business model, and they won't do the projects that have the potential to disrupt it or create entirely new business models that might not fit with the current strategy of the core business model. I've seen hundreds of innovation departments using the right buzzwords about bold, transformational change, but they end up doing incremental change to support the current business model. If that's not the objective you're aiming for, you're going to have to go about it differently. VB: Are business leaders hearing your message that they must establish an effective ongoing R&D capability for new business models unencumbered by their current business model, while at the same time continuing to develop new products and technologies to drive top line revenue growth from their current business model? Saul Kaplan: Many are. I hear a lot of leaders say their organizations need to get better at business model innovation. It comes up in discussions with leaders, but often they're not prepared to make the necessary changes. They don't have the organizational model that enables them to do it and so there's a lot of work to do to help leaders develop a business model innovation capability and capacity. More and more are getting receptive to the idea, but the truth is it's certainly not everybody. At the Business Innovation Factory, the organization I head, it's how we segment our market. BIF looks for leaders, not just company leaders, who know they need to experiment with entirely new models and social systems. We're trying to find these leaders so we can help them to be successful. We're not trying to convince leaders who aren't ready and don't want to experiment with new business models. We're trying to find those who do and help connect them with others in purposeful ways. VB: What is the value proposition of your organization, the Business Innovation Factory? Saul Kaplan: We call it BIF, which I started 8 years ago. Its value proposition is to enable R&D for new business models. We're trying to help people do more transformational things – to go from 'tweaks' to 'transformation'. We focus on leaders of organizations and communities who want to work in this transformation space and who know they need a new set of tools and approaches in order to do it. Over the 8 years we've been at it we've created a community of about 8,000 people from many organizations who want to go up the learning curve. We're doing because we're still learning how to do this work, and developing tools and approaches to do it. We have an annual Summit every year where some 400 or so come to Providence, Rhode Island. This year it's occurring on September 19 & 20 – it's BIF8. It's a total immersion and provides an inspiration for our transformation community to revel in innovation and transformation stories which are shared at the Summit. I look forward to it every year. It's so inspiring. And then we have a series of laboratories – we call them 'Experience Labs' – where we do sponsored project work by putting these ideas and tools to work in education, healthcare, and entrepreneurship. We are trying to do real world experimentation on how we're going to transform those large social systems. VB: Why is the Summit so popular and successful? Saul Kaplan: Because it's less of a summit and more of a community. It's 400 like-minded innovation junkies who come pre-wired for transformational change. We don't have to convince them that they need transformational change. They know this already, and they want to interact with other transformational artists, other innovators, and with other renegades. They know they can learn from people who are doing this outside of their own domains. We do what we call 'enabling random collisions of unusual suspects'. It's a big deal because we think the learning and real gold is in the grey areas between us. This is different than other innovation meetings. Why do we keep going to meetings and events where all the people are from our industry and they're talking about the same things they've been talking about for the last 20 years? What are we possibly going to learn? I say go to a meeting where there are unusual suspects who are bringing new stories, perspectives, and ways to do things, and then allow yourself to collide with them so that you can begin to see how other people are doing this kind of work in completely unrelated areas. This will enable you to think about what you might bring back into your world – to your industry, to your community. VB: You talk about your "road warrior consulting days." What do you mean by this term? Saul Kaplan: I spent a lot of years as a road warrior. I was seldom home as I traveled around the world 5 days a week, sometimes 6. I loved what I did. For me it was perfect because every day there was such a steep learning curve. When I'm on a steep learning curve I do my best work. I've always managed my career not by job title, money, the size of my office, or how many people report to me but by the quality of my learning curve. I knew that if I stayed on a steep learning curve all the rest would happen, and I was fortunate that it did. For 20 plus years I had the privilege of being a road warrior consultant with some really top firms. I was with Arthur D. Little early in my consulting career; subsequently I was a senior partner with what was Anderson Consulting and later became Accenture. I'm still discovering today what I learned during those years. I was so busy I didn't have enough time to fully reflect. But what an exciting time! I have every imaginable black and blue mark related to what it takes to organize large-scale change in large institutions. My take away was that as much as our rhetoric was about bold change, most of it ended up being incremental change. They were important changes that were valuable and provided good improvements in current business model performance, but there weren't many opportunities where our clients' executives really wanted transformational change and the creation of entirely new business models. It became clear to me that we needed to figure out how to talk about transformational change, and to create a unique set of tools and approaches to doing it. VB: You describe yourself as an innovation junkie. Is it all about a passion for transformation with a sense of urgency? Saul Kaplan: Yes. I describe our community as consisting of innovation junkies. The hallmark of an innovation junky is someone who always thinks there's a better way. This is both a blessing and a curse, by the way. It's a double-edged sword. It's a blessing in that you're always trying to make things better for yourself, your people, families, and communities. But it's also a curse because you're never satisfied or complacent. You never celebrate anything because you're always onto the next better thing. As an innovation junkie I'm always running at a high intensity level and considering what to do next and how to do it better. It may be a small thing like driving to work this morning wondering why I didn't have better information about the traffic jam in front of me. Or it may be big things like when I drove by a public school on the way to work and wondered how we let our public school system atrophy to the place it has, and when are we going to take advantage of twenty-first century technology to transform our entire education system which is desperately needed. Innovation junkies like to play at the small level, and they also like to tinker at the big social systems level. Its incredibly rewarding work, but it can be awfully frustrating because you're never done. It's never enough. VB: Do you take the time to celebrate successes before you strive for the next best thing? Saul Kaplan: I'm trying, but I have the disease badly so it's hard to get me to celebrate. I'm thrilled and incredibly happy about the work we do, and it's incredibly rewarding when members of our community collide with each other and build new connections, ideas, and collaborations. When we deploy them through our labs to make a difference in society we should celebrate more, but our whole team is made up of 'Type A' personalities. VB: You don't have time to celebrate. Saul Kaplan: Thinking about it, we don't celebrate enough. Or when we do it's for a short period of time, and we're right back to asking, "OK, what's next?" VB: You say people are either wired as innovators or they aren't. Does this mean most cannot learn to be innovators? Saul Kaplan: I get a lot of push back on this matter. I hear a lot of people talking about wanting to create a culture of innovation as if we're going to turn everyone into an innovator. This is particularly for the area I focus in, which is about transformational change and business model change, but I'm not convinced it's the right approach. You don't want everyone in the organization disrupting it. You want a lot of people making it better, being creative, improving it, doing their job with passion, and enriching their work. You don't want or need everybody blowing up the organization every day. However, you do need a sandbox where you can develop new business models. There are some people that are more wired to this type of disruptive work than others are. I know lots of leaders for whom I could stand on top of my head, give convincing consulting presentations, hold hands, and try every other thing possible but they're not going to change. They don't want to change because it's not what they're about. They're wired to focus on improving the performance of the way their organization works today. I've stopped trying to change these types of people. Earlier in my career I thought you could proselytize. I thought if I yakked enough I could convince them to change. I no longer believe this so now I spend more time trying to figure out how to segment the market. Who are the people who are wired to experiment and change, and who aren't? Then we can focus on connecting the people who are and enabling them with the right tools, and we can stop worrying about trying to get everybody to be an innovator. It's just not necessary. VB: You say, "Transformation is a team sport." Saul Kaplan: It's definitely a team sport. You have to achieve transformation in a collaborative way. When you're trying to create change at the business model or social systems level you're not talking about inventing something new. It's not about an idea or inventing a technology. It's about connecting capabilities in novel ways to solve problems in the real world. This is a team sport which requires collaboration, and generally speaking most are not good at it. Most have been brought up to be individual rather than team contributors. I talk about building 'collaboration muscle' which must be explicitly done. VB: No doubt the cultures of some countries are more encouraging than others of collaboration in business. Saul Kaplan: It's partly about your culture. It's also partly about how your business model works to deliver customer value. Remember, in the industrial era we grew huge organizations with deep functional silos and this served us incredibly well during those times. They don't serve us as well today where a lot of our work is horizontal – working across functions, across disciplines. Today a lot of innovation is about innovating in the grey area between our disciplines. We have to go from being incredibly strong vertically to being incredibly strong horizontally, and many are not very good at working – thinking and acting – horizontally. Not that vertical isn't important, but we have to go towards business models that are less about delivering through verticals and more about the horizontal. It's more about delivering, configuring, and reconfiguring teams of people from the vertical to deliver to customers and solve customer problems. This is a very different business model. VB: By 'verticals' do you mean organizational silos? Saul Kaplan: However you define verticals. Some companies define them as functions, such as marketing, sales, warehousing, distribution, and manufacturing. Other companies define them as groups of customers, which lends itself more to defining and delivering customer value. However you've developed the silos within your organization, the first thing is to understand whether or not you can deliver better value by thinking and acting more horizontally than vertically. VB: "My mantra is 'Think Big, Start Small, Scale Fast.' Is this the secret to successful business model innovation? Saul Kaplan: It's really important to have bold inspiring aspirations. People get motivated and passionate about being part of something big, and about making a real difference. But you have to start small. I don't want to spend 6 months to a year planning, putting together business plans, and trying to convince legal and finance that we've met all the thresholds. It's about taking a concept and getting out into the real world and seeing what works. So a business model innovation is about getting away faster from the white board and onto the ground. How do I prototype an idea? How do I take a napkin sketch and create a prototype which puts me out in the marketplace tomorrow rather than a year from now. The mantra is start trying it. Have you ever watched the way millennials do this? Dinosaurs like me are used to 6 months of planning and a further 6 months for decision-making. The millennials go back to their room and overnight mock up a website, attach a transaction engine to the back end, and tomorrow they're able to move a customer through a new platform. I'm still sitting in the planning mode and they've already got it built. We need to be more like those millennials and the way to do this is to involve them more in this process. Why aren't we prototyping the way these business models can work and quickly testing them? That's what business model innovation is about. We talked about scale fast earlier. The business model needs to be able to scale to more customers or provide increasing in-depth services to existing customers in order to generate the revenues necessary for growth. VB: You talk about turning cities into innovation hotspots and living laboratories. Is this possible? Saul Kaplan: Yes it is. Increasing numbers of people are living in cities around the world. Cities are innovation hotspots in the making. They have all the diversity you could ever want. There are ways to exchange information and ideas across the whole cities, so why aren't we turning cities into platforms for business model experimentation? Cities should be laboratories, and we should be bolder about doing this. Why aren't we experimenting with new hospital and health care systems, or with new colleges and education systems? We should be turning cities into these kinds of laboratories. VB: Are you optimistic that transformation of social systems, including education, health care, energy, entrepreneurship, and others can occur in time to ensure the U.S.'s economic prosperity? Likely this question applies to other countries such as those in Europe. Saul Kaplan: Yes, it does apply to most if not all countries. I'm an optimist, but we better get on with it. Rather than thinking about innovation as invention we have to start thinking about it on the delivery side for business models and social systems that actually solve our problems. In the U.S. why do we live in a country with incredible technology, but an education system that is atrophying? Why do we have a health care system where not everybody can get access to it? Why aren't we leveraging technologies and more disruptive ways to solve these and other problems? If we were more experimental, not at the technology level but at the systems level such as doing R&D for new business models to solve our problems, we could make real progress. Secondly, imagine the economic activity that would be generated if companies got stronger and competed around the world, and if new companies were formed in order to deliver value in new and different ways. We could unleash an incredible economic revival if we were to figure out how to unleash these ideas, tools, and practices at our personal, organizational, and community level. VB: Is BIF working hard to make this happen? Saul Kaplan: Yes, and we welcome everyone to participate in our conversation, come to our annual Summit, and connect with the work that's going on in our labs. In my book, The Business Model Innovation Factory, I lay out my personal experience, ideas, and a road map for how readers can deploy these tools for themselves, their organizations, and their communities. There are lots of ways to connect with the content, to participate in the conversation, and since we're moving up a learning curve we need all the help, input, and connections that we can get. VB: Do you have any final advice about how to stay relevant when the world is changing? Saul Kaplan: We need to try more stuff. In order to be relevant in the twenty-first century we have to learn how to reinvent ourselves. We need to be able to change our personal business models and, in the end, the way to do this is to try more alternatives. We've got to be comfortable trying, failing, learning quickly, and redeploying what we've learned into new ways to deliver value. If we're not doing this we're going to become less and less relevant as the twenty-first century progresses. It has been inspiring to speak with another innovation junkie with a message and passion to inspire major change in business, other organizations, and major social systems. BIF has a great business model and passion to make a difference. 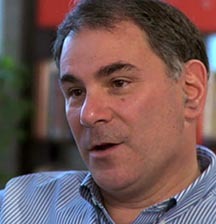 Saul Kaplan is the author of The Business Model Innovation Factory: How to Stay Relevant When the World is Changing(2012).